I have to admit this was a difficult dish to make look as good as it tastes. This is basically classic Latin American comfort food, Paula Peck style. 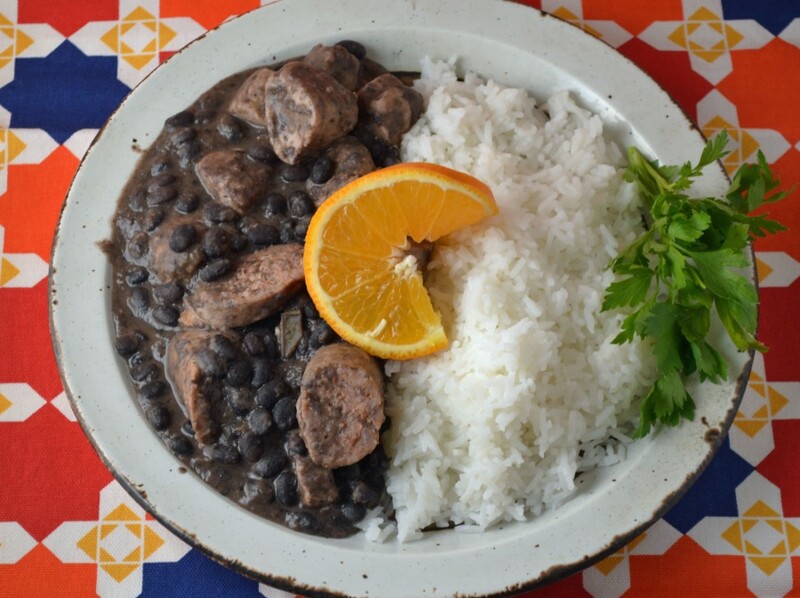 I refuse to credit a specific country in Latin America for Pork Black Beans and Rice because so many of them have their own version. I would hate to offend one country if this is not their authentic preparation, or leave another out that makes a similar version. One thing’s for sure, it’s hard to go wrong with black beans and rice on a chilly fall day. In this case, the addition of pork sausage and chunks of pork tenderloin give this dish a salty meaty flavor and also makes a protein packed meal that keeps you full longer when you’re out raking leaves or picking apples. My favorite part of this dish is the orange. That orange slice you see in the photo is not just for decoration and color, there is actual orange juice in this dish. It’s mixed with red wine to deglaze the pan (release all of those flavorful brown bits) after browning the pork. This is the acid and sweetness the salty fat of this dish needs to provide that balanced flavor our taste buds look for. So ignore the deceiving sloppy look of these pork and beans – serve with orange slices and these are far from the blah rice and beans you may be used to. Wash, pick over beans and soak overnight or cover beans in water and bring to a boil for 2-3 minutes, remove from heat and cover for 1 hour. Drain. Heat olive oil in a deep pot. Add garlic, onion, and green pepper. Saute until tender and season with salt and pepper. Add beans and enough additional water to cover them. Cover pot and simmer 45 minutes or until beans are tender, adding more water if necessary. Drain liquid from pot and reserve. Remove two cups of cooked beans from pot. Cover remaining beans to keep warm. Puree the two cups of cooked beans with as much liquid as necessary in blender. Stir bean puree into cooked beans and keep warm. Brown pork cubes and sausage in their own fat in a skillet. Pour off fat when meats are golden all over and cut sausage into 1-inch pieces. Add both meats to beans. Season with additional salt and pepper, if required. Pour orange juice and wine into skillet that meats were browned in and cook on high heat until liquid is reduced by half, scraping up any brown bits. Pour into bean mixture and stir to combine all flavors. Serve over fluffy, steamed rice. Adapted from “The Art of Good Cooking,” by Paula Peck.